The PacWest Machinery team welcomes its newest member. (L-R) are Tyson Gates, parts manager, Portland; Mike Stepan, sales representative; Tim Hurst, PacWest general manager of Oregon and southwest Washington; Scott Sumner, service manager of the Oregon market; Marty Krueger, sales representative; and Ed Kanable, sales representative. PacWest Machinery announced that Scott Sumner has been promoted to the position of service manager of the Oregon market. Sumner has more than 25 years in the construction industry, of which 14 of those years has been with the Volvo brand, most recently as a senior field service technician of PacWest. He will be responsible for overseeing the day-to-day management of the company's service departments in Portland and Eugene, Ore.
A native of Albuquerque N.M., Sumner has been in the heavy equipment industry since the beginning of his working career. 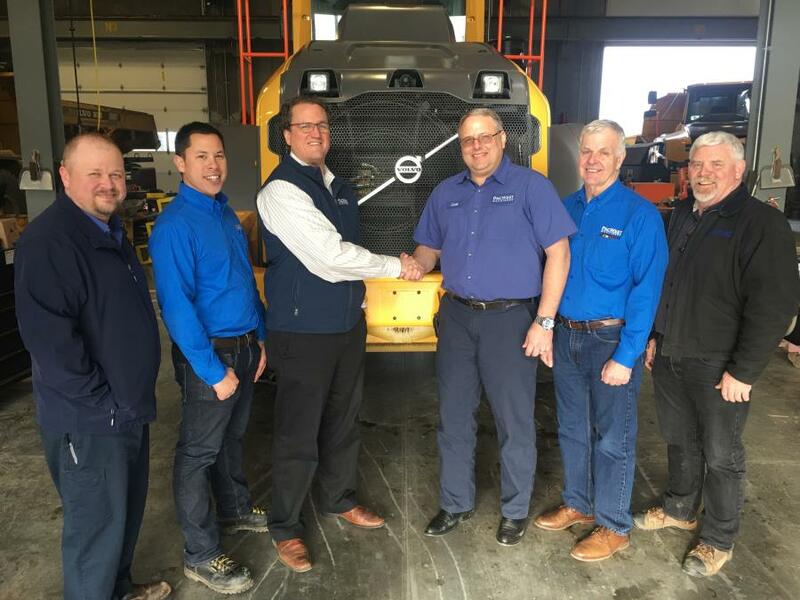 PacWest Machinery is one of the newest Volvo Construction Equipment dealers in North America with responsibility for the sales, rental and aftermarket support for the full line of Volvo's general production equipment, road machinery and compact equipment. The company also sells and services machinery from Metso Minerals, Roadtec, GOMACO, Tymco, SDLG, Etnyre, Broce Brooms, FRD Furukawa and Genesis. PacWest Machinery provides equipment and services to customers from four branches located in Kent and Spokane, Wash. and in Portland and Eugene, Ore., plus additional support from an extensive mobile service fleet.